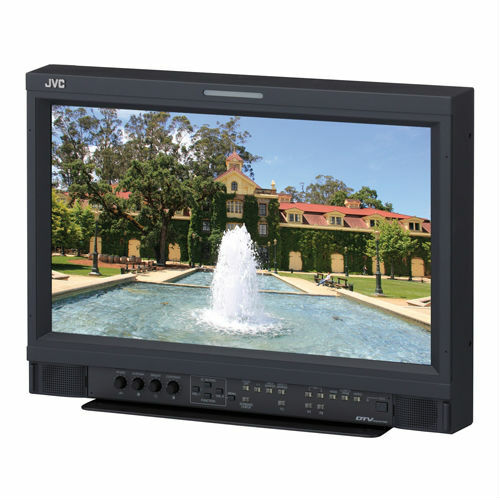 JVC has introduced the new DT-E Series of professional monitors to provide a cost-effective alternative to the industry standard DT-VG1 high-end monitors. They feature a newly-developed TN Panel with LED backlights which provide improved contrast and black level and are perfect for use as control and studio monitors. The DT-E Series monitors also come complete with free calibration software to aid in achieving optimum picture quality. Power consumption on the 15 inch DT-E15L4 is 20-30% lower compared to CCFL driven lighting, which also has the effect of increasing the product lifetime by up to 300%. The imaging is also smoother and more consistent with the LED backlighting. Saving energy not only reduces running costs but also helps protect the environment by reducing the monitor’s carbon footprint, and since the LED drive doesn’t include any harmful chemical elements, unlike traditional CCFL backlights, the new monitor range is exceptionally environmentally friendly. This lower power consumption also means we can add DC power support, for high image quality even in field use.